2 bed 2 bath Modern Condo, with Garage Parking, view of pool & hot tub. Beautiful condo in prime location. From this South Scottsdale location, you are with in a 5 to 15 minute drive of world class shopping, restaurants, golfing, and much more. Specifically less than 15 minutes from Old Town Scottsdale, Fashion Square Mall, Scottsdale Baseball Stadium, and Tempe (and Tempe Marketplace is 5 minutes), and super quick access to 101 freeway for easy commute ANYWHERE in the Valley! Very comfortable and quiet location in interior of complex. Just a few steps from heated swimming pool (pool is heated in winter/spring months) and jaccuzi w/view of the pool. Deck and sliding doors is south facing. Fully Furnished featuring comfortable furniture. Air conditioning, two HD flat screen TV's (in living room and master), including new 42 inch High Definition flat screen in living room. The living room has an XBOX360, with basic cable TV, streaming NETFLIX On-Demand Movies included. The master bedroom also has basic cable, TV/DVD and streaming Netflix On-Demand. Cable channels include ESPN, Fox Sports 1, ESPN2, CNN, Bravo, & more. Computer is also in condo (high speed internet and Wi-Fi access is included!). Full sized bed in 2nd bedroom. Twin sized air mattress with built in electric pump is also in condo for a 3rd bed. Completely renovated in 2007, than new carpet & interior paint in 2014. Kitchen has granite counters and stainless appliances. Both bathrooms are updated w/granite counters and have skylights. 2nd floor/Top floor location, and private entry. Full sized washer/dryer and secure, private, GARAGE parking. Parking your car in a garage keeps it cooler and secure! Large fenced dog park as well. My response time is much faster than the website indicates! We respond via email often, and the site only tracks your response if you respond on the website! Otherwise, about me, I am married with 2 wonderful kids, Liam 5 and Riley 8 :-). We live in Western Washington but have family in Arizona and love using the condo to get some sunshine and visit family as often as we can. 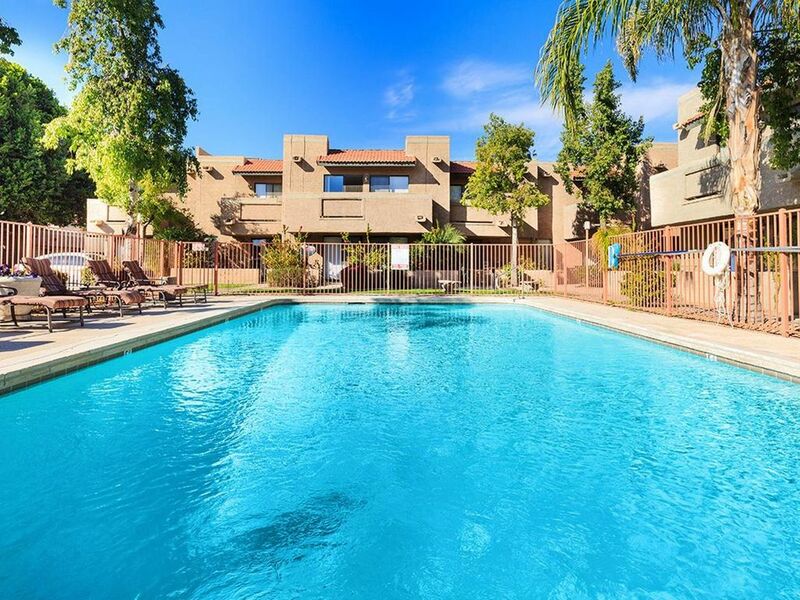 We love this condo, because it is quiet, right next to the heated pool, and a short drive to everything we like to do and visit when we come down. The 2 beds 2 baths makes it ideal to bring friends down or bring the kids down. The modern granite counters and updated finishes make it really nice as well. Garage parking, view of heated pool. Central location to Scottsdale, Tempe and Phoenix. Top floor so no noise from above! Xbox 360, & Netflix & HBO included. Granite counters and skylight in both baths. Granite slab counters and stainless appliances. 12+ fiction and non fiction books. A few kids pool toys. 7 or 8 DVD's. Amazon Prime, and , HBO & Netflix in living room with cable, and cable and Netflix in master. 2 video games and XBOX 360. Common area grass in complex and fenced dog park. Small back deck with bistro table for 2, with view out to pool. Private Garage parking with remote garage door opener. 2 swimming pools in complex, the nicer heated (heated during fall/winter/spring months) swimming pool and jacuzzi are just steps away. Full size washer/dryer. Condo has computer with high speed internet and Free Wi-Fi access for your notebook or IPAD. New 42 inch Flat screen TV in living room and 32 inch flat screen in bedroom w/DVD player in both. Living Room has XBOX360 with Netflix, HBO & Amazon On-Demand Movies included! Cable & Netflix on-demand in master as well. Air conditioning, Small patio set on back deck. Extras like iron, coffee maker, extra towels, kids pool toys, and pack and play baby crib is also stored in condo. Thank you for sharing your condo with us. What a great place! Close to everything in Scottsdale yet far enough away to be a peaceful retreat. The complex is quiet and well maintained. The pool is lovely and having a garage was an added bonus. The unit is well decorated and you have provided many extras which made for a very comfortable vacation. We would most definitely stay with you again the next time we visit Scottsdale. Thanks for being such a great host. Property was very nice and met all our needs. The property was nice and in a really good location for us. He has just about everything you need. The directions did say there were extra blankets in a closet which we did not find. If a person were going to use the blow up mattress, they would not have a blanket. I sent him some emails through the app and he either did not reply or the reply was quite a bit later. Still waiting to hear a reply wondering when I might get the damage deposit back. Otherwise a very nice place to stay. Nice to have the garage. Thanks Darla. We just were in the process of replacing some old blankets that were worn, so apologize you didn't have those for your stay. Future guests should know we are on top of that and are buying new ones so we have extra blankets. I believe I emailed you back yesterday on the damage deposit reimbursement. The websites email sometimes goes to my spam, so I leave my phone number in the welcome packet, and encourage tenants to call or text me direct with any concerns. We definitely pride ourselves on being responsive. Thanks again for staying with us and hope to have you back! Great location for everything we needed! Paul was super nice and responded to all my questions quickly! Nice, clean condo in quiet neighborhood. This condo was just the right size for my husband and 2 teenage boys (16 & 18). The 2bdrm/2 full bath floor plan was perfect. The location was 20-30min drive from most attractions/cities (Mesa, Tempe, Phoenix, Odysea Aquarium, Camelback Mtn, etc.) but easily accessible to the highway (101). It was cozy, clean and Paul was very responsive to any of our inquiries. Due to the close proximity of other condos (thin walls) and lack of available outdoor space (besides the pool), I would not recommend this condo for families with smaller children or those that can not entertain themselves quietly. I would highly recommend this condo however for couples or individuals looking for a quiet getaway with plans to drive to and see attractions in the area. We really enjoyed our stay at this apartment. The location was great and the layout of the apartment was good for a family of four. My son wanted to sleep on the blow up bed, but it deflated within a few hours and there were no extra blankets. My understanding is that this is being fixed, however, so I'm sure others will find it quite comfortable. Thanks for the review Leilah. Just to be clear for guests, the condo is a 2 bed 2 bath with 2 standard beds. The air mattress therefore was there in the closet to pull out as a 3rd bed, and as it turns out,..it turns it failed on them. It had been a long time since that 3rd bed and all of the extra blankets had been needed. We offered to bring more blankets out on day 2, but she no longer needed them. The point being is if you need 2 or less beds, the condo is setup and ready to go...but we just ended up not having everything set for a 3rd bed arrangement for these guests when the air mattress failed.. We are in the process now of replacing it--and adding more blankets. (For when multiple kids are staying and a 3rd bed is needed). Glad to have attention brought to this so we can make our condo better! We thoroughly enjoyed our time at Paul's condo. The accommodations were great - comfortable bed in a nice-sized master bedroom, small but adequate kitchen (more fun to go out for dinner anyway! ), plenty of nice plates and pots and pans, nice pool, good WIFI, and nice soft towels. If you like to walk, the neighborhood is very safe with easy access to parks and walking trails. The location of the condo was perfect - close to restaurants, shopping and major highways. We would definitely go back. Thanks for the two month retreat! 5 to 15 minute drive to Old Town, Baseball Stadiums, Fashion Square Mall, Tempe Marketplace, and world class golf, art and shopping. Central location 2 miles from 101 freeway means you are with in 5-20 minutes of every major attraction in Scottsdale, Phoenix and Tempe. On the local Trolley route, which comes by multiple times a day during the weekdays. Public park and Biking trails to old town is very close-by. Heated swimming pool, jacuzzi, and a 2nd swimming pool in the complex as well. Very quiet and private setting in condo.